You are currently browsing articles tagged John Calvin. The philosophies of the age had run their course, leaving their adherents, spiritually empty. Reflect on the many idols of worship Paul found in Acts 17 as he stood in the midst of the Areopagus in Athens. Yet these idols did nothing to satisfy the souls of the people. all peoples. They didn’t have to learn a new language to share the gospel, a fact which facilitated the spread of Christianity. The Romans had conquered the then known world, bringing peace with order, which enabled the early Christians to travel all over with the gospel of real peace. The Hebrews had all the prophecies regarding the coming Messiah completed, waiting for their fulfilment by the Birth of the Savior. Truly, Christ came at the right time in time and space history. We can receive that truth intellectually, but far better to receive it spiritually. So let us make sure this Christmas that we have received Him as our personal Savior by faith alone. Let us pray for all members of our respective families, and friends, that they too have received Him as Lord and Savior. And so on this December 25, 2015, we say Merry Christmas, dear readers of This Day in Presbyterian History. Today we are pleased to have as our guest author the Rev. 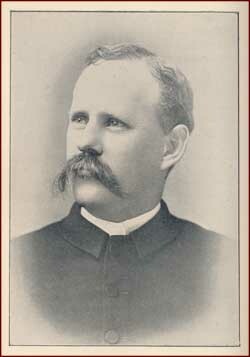 Dr. David W. Hall, pastor of the Midway Presbyterian Church (PCA) of Powder Springs, GA. It was Dr. Hall who so competently headed up the Calvin 500 celebration just a few years back, a celebration which included the publication of almost a shelf of new works on the life and ministry of John Calvin, with several of those works written by Dr. Hall himself. 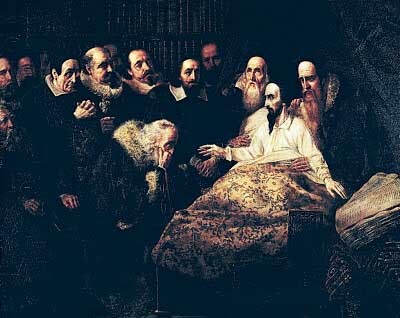 On April 25, 1564, sensing the nearness of death, Calvin filed his final will. In it he pled his unworthiness (“Woe is me; my ardor and zeal have been so careless and languid, that I confess I have failed innumerable times”1) and thanked God for mercy. He appointed his brother, Anthony (whose reputation for divorcing an earlier wife due to adultery had been maliciously used to malign Calvin himself), to be his heir, and in his will he bequeathed equal amounts to the Boys’ School, the poor refugees, and his stepdaughters. He also left part of his meager estate to his nephews and their children. To vindicate Calvin against charges of greed, Beza reiterated what Calvin had stated earlier: “If some will not be persuaded while I am alive, my death, at all events will show that I have not been a money-making man.”2 When his will was notarized and brought to the attention of the Senate,3 members of that council visited the declining Calvin to hear his final farewell personally. He denied that he had written hateful things about others, and he confirmed that the pastors had elected Beza to be his successor. “Watch that you help him [Beza],” exhorted the dying Calvin, “for the duty is large and troublesome, of such a sort that he may be overwhelmed under the burden. . . . As for him, I know that he has a good will and will do what he can.” Further, he requested that senators not change anything in Geneva’s structures and urged them “not to innovate—we often ask for novelties—not that I desire for myself by ambition what mine remains, and that we retain it without wanting better, but because all change is hazardous, and sometimes harmful.” The advice from this leader is filled with layer upon layer of wisdom. When Calvin passed away almost a month after making these comments on May 27, 1564, “the whole State regretted” the death of “its wisest citizen . . . a common parent.” He was interred in a common cemetery at Plein Palais, finally finding the anonymity he craved. That, one historian wrote, was characteristic of Calvin in life as in death.5 The widespread notice and sadness at his death should serve to correct any faulty view that his contemporaries either despised him or underestimated his importance. He was mourned, and his large number of friends would keep his memory alive far more than some contemporaries would have predicted. Source: David W. Hall, The Genevan Reformation and the American Founding (Lexington Books, 2003). 1 Theodore Beza, Life of John Calvin (contained in John Calvin, Tracts and Treatises on the Reformation of the Church [Grand Rapids, MI: Eerdmans, 1958], vol. 1), cxxv. 2 Theodore Beza, Life of John Calvin, cxxxviii. 3 Beza refers to this Little Council as the “senate.” See Theodore Beza, Life of John Calvin, cxxii. 4 This translation is from an unpublished translation of Calvin’s “Farewell Address,” trans. Kim McMahan of Oak Ridge, TN; originally published in 1999 at: http://capo.org/premise/99/jan/p990110.html. 5 Emile Doumergue, The Character of Calvin (Neuilly, La Cause, 1931), 173. It was the happiest time in the ministry of John Knox in the sixteenth century. Ministering in what he had called “the most perfect school of Christ that ever was on the earth since the days of the apostles,” Geneva, Switzerland was where John Knox spent his exile from his beloved Scotland. It was not a vacation in any sense of the word. He preached three sermons a week, ministered to the English and Scottish exiles there, and studied the Scriptures in the Hebrew and Greek for the purpose of translating a new version to be known as the Geneva Bible afterwards. On the tenth of March, 1557, Knox received a communication from five nobles in Scotland which stated that the faithful believers in Scotland “have a godly thirst day by day of your presence ” back in Scotland. Further, these believers are “not only glad to hear of your doctrine, but are ready to jeopardize their lives and goods in the forward setting of the glory of God, as He will permit.” In essence, John Knox was missed by the faithful back in Scotland who wanted him to return to them. After receiving counsel from John Calvin and other godly ministers in Geneva, they with one consent urged him to return home. He left at the end of September, 1557, reaching Dieppe, France, on February 19, 1559. He had been there once before, and preached with great success to the Protestants of that area. However, upon arriving, he received two letters which brought him grief, as those same five nobles now urged him to delay his return to Scotland. He replied with vigor, urging them to change their minds about this delay. Meanwhile, in the intervening seven weeks before he was to receive an answer, he preached the Word of God in Dieppe with great results, with the number of the faithful increasing in that area. With that, Knox tried to enter through England, but was not permitted to do so by the Queen. So he sailed directly to Leith, Scotland, landing on May 2, 1559, never again to leave his place of birth. It was said that the provincial council had been meeting for several days scheming on how to proceed to the trials of Protestant ministers in the kingdom. When they were in the midst of a meeting on May 3rd, one of the number rushed into the chamber to say, “John Knox! John Knox is come! He is come! He slept last night in Edinburgh!” Panic struck the meeting as they broke off their meeting with great haste and confusion. Nothing better could prove the importance of his timely arrival than the consternation it brought in the hearts of his antagonists. Words to Live By: We will ever see attempts by Satan to hinder the great work of Reformation, both then and now. We thus need to see with the eyes of faith the oft quoted conviction of the apostle Paul, when in 1 Corinthians 16:9, he exclaimed that “a wide door for effective service has opened to me, and there are many adversaries.” Nothing has changed today for biblical faith and life. For every wide door for service, there will be many adversaries of the gospel. Be faithful, and despite their presence, work for Christ now. The revival was going strong in the little Virginia church on the McCormick farm. Minister after minister preached the Word of grace from the Word of God. One Sunday morning, the challenge went out to the audience gathered, “I want everyone who is on Christ’s side to stand up.” People stood up all over the sanctuary, except the young man named Cyrus McCormick. The twenty-one year old went back to his house where he went to bed. Before he fell asleep, his godly father came into his room and said, “Son, don’t you know that by being quiet, you are rejecting Christ?” Young Cy had not thought of it that way. He rose up, got dressed, and even though it was dark outside, went to see and talk with Billy McClung. He was a believer in Jesus. Waking up the young man, he asked how he could know Jesus and get peace with God. Billy McClung was used of the Lord to show the way, and that night Cyrus McCormick committed himself to Jesus as his Lord and Savior. The next Sunday morning, he did what he did not do the previous Sunday, and publicly gave his testimony of having trusted in Jesus Christ. All the spiritual ground was prepared by his godly parents, and grandparents, and ancestors. He came from a Scotch-Irish heritage of Covenanters who had stood for King Jesus in the old country of Scotland and Ireland. Being persecuted for the old faith was part and parcel of the life which they lived and died for in the “Killing Times” of the mother country. Young Cyrus, born onFebruary 15, 1809, had the spiritual upbringing of both the Bible and the Westminster Shorter Catechism. He was a spiritual product of the theology of Martin Luther, John Calvin, and John Knox. The twin truths of the sovereignty of God and the responsibility of man were stamped into his character. Living in the Virginia farm was not easy however. Especially was it difficult to harvest the grain before it spoiled. Cyrus’s father had tried for years to build a machine which could reap the wheat quickly, so it wouldn’t be lost by spoilage. Cyrus McCormick took over for his father and with the natural gifts of God upon him, in 1834 took out a patent for a reaper which could accomplish all which he and every farmer of the land had long desired. But he didn’t stop there with the invention. He mass-produced the machine for usage by farmers all across America. Of course, this brought in incredible wealth to this Christian man. Many have had the sad testimony that riches has ruined them in their Christian testimony. But Cyrus McCormick was different. He simply brought his heritage of Christianity, and specifically the rich Presbyterian heritage into his business life, so that family and friends could not separate his religious life from his business life. Even after marriage to Miss Nettie Fowler, and a family of six sons and daughters, he gave away huge sums of money to Christian and especially Presbyterian ministries. After his death in 1884, his wife continued the ministry of using her wealth for Christian enterprises. McCormick Theological Seminary in Chicago is named after him because of that generous financial support toward that institution. 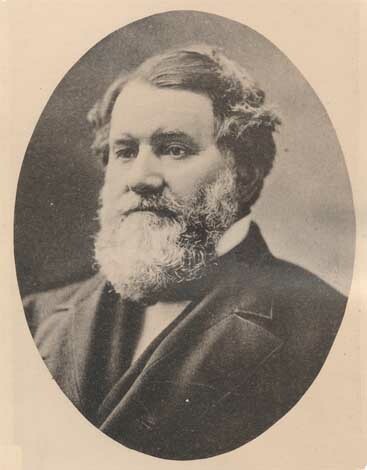 Words to Live By: Cyrus McCormick’s favorite Bible passage was Romans 8:31 – 39 . That is our application, or words to live by portion for today. Turn to it now and read the gracious promises of the elect of God. The German historian, Leopold von Ranke, was the one who declared that John Calvin was the virtual founder of America. Today, July 10, 1504, is the birth of this Swiss Reformer, John Calvin. And yes, this is the first time we honor one in these historical devotions who is not an American, or for that matter, a Presbyterian. But his influence pervades all of our history and our culture, so we briefly look at the man and his message. Do we have any idea of how many Calvinists there were in our country up to the time of the American Revolution in 1776? Loraine Boettner states that out of the three million citizens of the colonies at this pivotal time in our history, 900,000 were Scotch-Irish Presbyterians, 600,600 were Puritan English, 400,000 were German or Dutch Reformed, and there were a lot of French Huguenots, who were Calvinists. Two-thirds of our citizens had been trained in the school of Calvin. 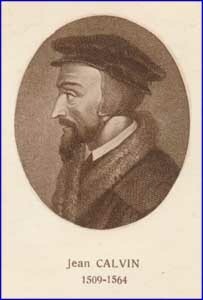 Calvin was the first Reformer to demand a complete separation between the church and the state. Note carefully what I have just said. It wasn’t a separation between God and the state, which is the commonly held interpretation today, but between the church and state. No one denomination was going to be the favored church of the government, as it was the case back in England. There would be freedom of religion. And that unique idea could be laid at the feet of John Calvin. Next, our republic was to be looked upon as a representative republic. In fact, if you look at the Presbyterian form of government, with its representative elders in the congregation, we can see how our founding fathers simply took a leaf out of the Presbyterian form of government. Let’s enter next, what has been called the Protestant work-ethic in this whole discussion. Calvin held to the idea that every person’s calling can be characterized as a Christian calling, enabling them to serve God in every area of life. That has certainly helped our people work hard in their respective jobs, knowing that they are serving God in those jobs as well as that one who has been called to the pulpit to serve God. Further, the Geneva Bible came to these shores by the pilgrim forefathers. This was the version whose footnotes were decidedly Calvinist. 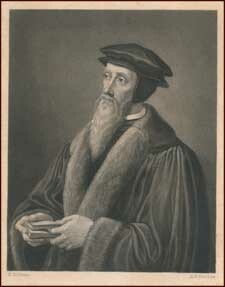 For all these reasons, we honor John Calvin today. Words to Live By: Today Calvinism is almost a dirty word. We need to reclaim its force in people’s lives and equally in our national life, if we desire to return to the greatness of our land. If you, reader, are largely ignorant of this Reformer and his place of influence in the early days of our people, make sure that you are not neglecting the Westminster Confession of Faith and catechism readings, which are a part of Calvin’s legacy. And delve into his Institutes of the Christian Religion, which will more than repay you in bringing Biblical theology into your faith and life.